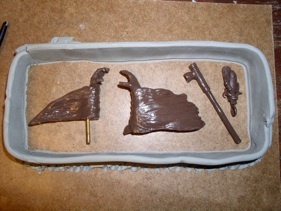 Initial layout of parts to be molded. Preparation of the mold for rubber application. “Mother Mold” to give the mold stability. The following process is dealing with a master made from an oil based clay. There are other instructions at the end of this section and/or available via clickable links as noted within these directions. 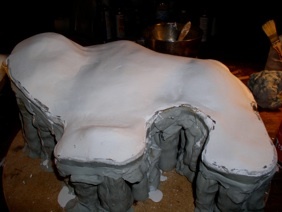 To start you will have to figure out what the best way to make the mold will be and this will vary with each piece. The examples used here are of Cynthia’s Buffalo Woman. 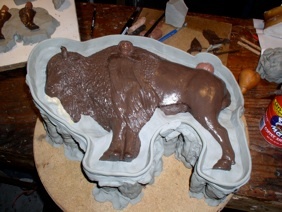 Cynthia uses a sulfur free oil clay (does not react adversely with most RTV rubbers), called Classic Clay (available from http://www.sculpturedepot.net/clay-wax-tools/clay.htm). There are MANY different clay formulations and each artist tends to have their “favorite” so you will have to learn the particular characteristics of the particular clay you are working with if you are not already familiar with it. Sulfur free clay is the easiest to work with but there are work arounds for sulfur clays and other master materials. Here we will be dealing only with sulfur free clay masters. 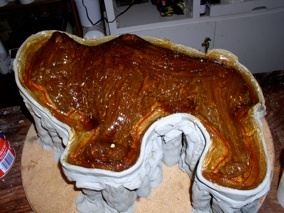 We will be dealing with molds that are to be used primarily for making waxes for Lost Wax Casting processes, but a good deal of this information and the resulting molds can be used to make molds for resin, cement, plaster and other casting materials. How the mold is made for these different materials will not be covered here as there are differences that need to be taken into consideration for molds to be used for these different casting operations..
Go to what ever page you are interested in for further information and/or instruction.